KAWASE Shinobu | Celadon Tall Flower Vase — Dai Ichi Arts, Ltd. This elegant celadon porcelain vase by artist Kawase Shinobu takes the graceful shape of a lotus flower bud. The superb quality of celadon glaze achieved by the artist is unmatched in its purity, a formal accomplishment that mirrors the tranquil subject of the piece. Great technical skill is required to successfully fire such tall pieces, and Shinobu has done so expertly. From many many failures and expert training, he is able to install a wood handle hanging from the ceiling, with the help of the fast wheel momentum, the wood handle spins to enable him throw such tall vases humanly impossible. He descends from a long line of ceramicists and began studying at an early age with his father. 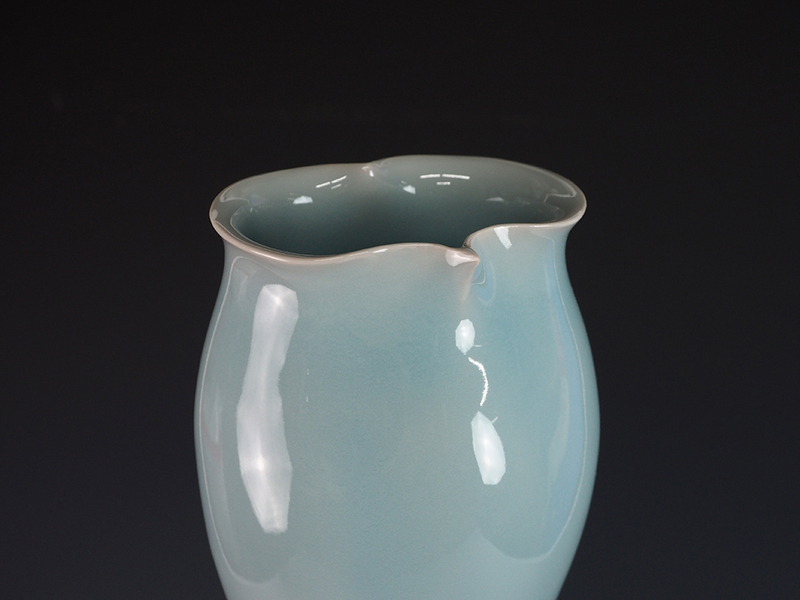 His early work adheres to the more traditional Song dynasty style of celadon, but he has been making inventive and original use of the medium since the early 1980s. Shinobu finds inspiration in nature, often taking formal clues from flora and fauna and translating them into elegantly minimal works of art. He has enjoyed great critical success and his award-winning ceramics can be found in many prominent public and private collections.